One of the few books I’ve read twice! Modern readers of paranormal romances and urban fantasies would be adrift without this early novel, published in 1794. This epic gothic novel (most editions run about 700 pages) begins with Emily St. Aubert’s idyllic life in the south of France in 1584. When her circumstances change, Emily finds herself orphaned, travels to Italy, and encounters bandits, an evil uncle, a valiant lover, eerie music, “supernatural” horrors, and ultimately, a mystery to solve. Ann Radcliffe (1764 – 1823) virtually founded the elements of the gothic romance, precursor to today’s paranormal romances. This is, perhaps, her most famous and popular novel. 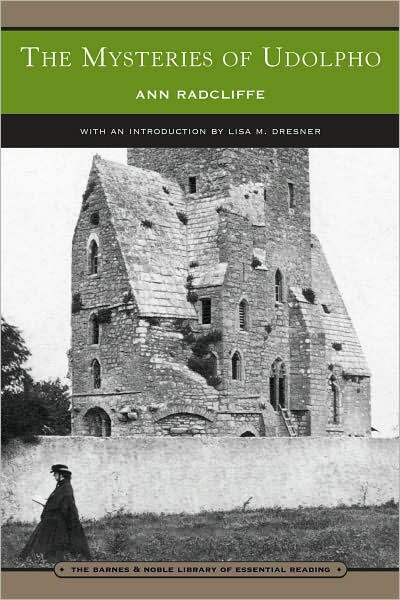 I read it for the second time as part of a college course on “gothic novels.” Reading it on a trip to Philadelphia, I enjoyed it just as much, if not more, the second go round. I’m even considering giving it another read. In fact, I’ve just downloaded it to my Nook! The Mysteries of Udolpho, famously parodied by Jane Austen in her Northanger Abbey, is a wonderful story, especially for anyone fond of the classics, mysteries, or paranormal romances. It’s an especially good pick to pass long winter nights when you’re snowed in and don’t feel like shoveling your way out of your driveway. Over three feet of snow in three days in Syracuse!